Roofing projects are definitely a big home improvement investment. In this project, you have to make many critical decisions. One such important decision is choosing a roofing contractor. In fact, one of the hardest aspects in a roofing project is choosing a roofer you can trust. Fortunately, Better Business Bureau (BBB) can help you. They have been protecting homeowners from fraud, low-quality products, and bad service. For decades, they have also helped homeowners make wise decisions, as they are the leader in advancing marketplace trust. That’s why when it comes to your roofing in Tinley Park, IL, and the surrounding areas, trust Rogers Roofing. We’ve been around for more than four decades, providing top-notch roofing products and services in Chicago and Northwest Indiana area. We are also proud of our BBB certification with a consistent A+ rating. What does this mean to you as a customer? Outstanding Customer Service – The A+ rating requires a clean slate. This means there should be no unresolved history of complaint against the contractor. 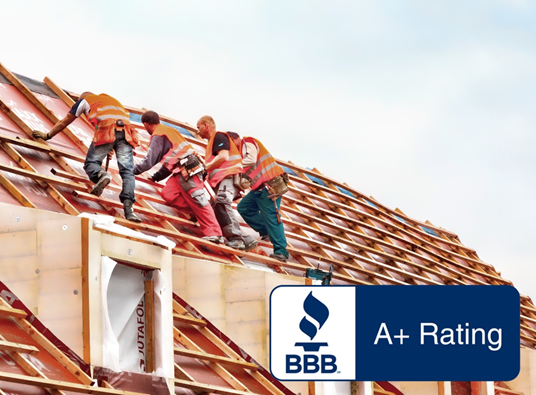 High-Quality Products – Customers can scrutinize the products offered by the roofer through BBB. This means that if a customer is dissatisfied with the product, the contractor will not have an A+ rating. Reasonable Payment Terms – A true roofing professional should be committed to providing outstanding service. They wouldn’t ask a customer for a full payment upfront. To ensure customer satisfaction, there may also be some flexibility on payment terms. Timely Project Completion – A delayed project will surely result in an irate customer, which will lead to lower ratings. That’s why for your Crown Point, Hammond, Highland, Munster, or Dyer roofing, make sure to hire the BBB accredited contractor, Rogers Roofing. Our A+ rating is further proof that we ensure high-quality roofing products and services. Learn more about our products and services by browsing through our website or by giving us a call. Choose Rogers Roofing for all your roofing needs in Chicago and Northwest Indiana area today!